In this morning's meeting with Jack Markell, I asked why the present budget proposal didn't include any big restructuring plans. The governor said we can expect such proposals down the road. First, Markell noted that he and his team have been on the job for ten weeks, and that it's hard to identify genuine savings opportunities in such a short time. He said he is taking a longer look at possible savings, and mentioned that roughly 100 state workers retire every month. That number may be significantly higher in the next several months due to a sense of uncertainty among state employees. Over the next year or so, these retirements will create savings comparable to the proposed 8 percent salary cut, and create restructuring opportunities that Markell intends to use. He also noted that the $155 million in stimulus funding being used to help with the deficit will go away and that other savings or revenue will have to be found. Governor Markell mentioned that he is open to considering the consolidation of school districts and taking a closer look at government services at state, county and local levels. Based on my own experience, I can say that these issues are fraught with issues of equity of service levels and funding. For those concerned that we may be passing up the chance to enact more sweeping changes in state government, the answer is that we have the time and the need to do it right. Stay tuned. As devoted readers of some of Delaware's leading blogs would know by now, Jack Markell sat down with a group of us this morning. Bloggers have already put posts up on the meeting at DelawareLiberal, DelawarePolitics.net and Down with Absolutes!. Apparently, it's enough of a story (think man bites dog) that I'll be talking with Allan Loudell of WDEL, 1150 AM about the session this evening at the top of the 5:00 hour. Obama is backing up this tough talk by pointedly refusing to rule out a court-ordered restructuring – he used the dreaded word "bankruptcy" – as an option for the automakers. He specifically mentioned that bankruptcy could be used to reduce debt – a signal to bondholders to take a deal now or else risk waiting months or years to pick up the crumbs left over when the companies are liquidated. What I'm talking about is using our existing legal structure as a tool that, with the backing of the U.S. government, can make it easier for General Motors and Chrysler to quickly clear away old debts that are weighing them down so that they can get back on their feet and onto a path to success; a tool that we can use, even as workers staying on the job building cars that are being sold. Note that Obama mentions the use of bankruptcy as a means to "clear away old debts," not old labor agreements or contracts with car dealers. Mr. Wagoner, who has served as G.M.’s top executive since 2000, agreed to step down after it was requested by the president’s auto task force. Like Chrysler, G.M. submitted a restructuring plan in February, which called for cutting 47,000 jobs worldwide and drastically shrinking the company’s models, brands and dealers. But people close to the auto task force said some members considered the plan inadequate to transform G.M. into a profitable enterprise. In advance of the report from Obama’s auto industry task force, I can identify one significant difference between the Chrysler and GM plans. GM is counting on the industry selling 10.5 million cars in the U.S. this year, while Chrysler says it can make it if only 9.1 million cars are sold. So far this year, the Chrysler benchmark seems more realistic. Delaware’s environmental advocates learned a great deal during the successful fight to bring offshore wind power to Delaware. We learned to work more closely together, and we developed an appreciation of the importance of economic analysis in reviewing environmental policy. The public discussion about energy reflects a changing understanding of the interplay between our economic interests and environmental interests. The conventional wisdom that the public’s environmental interest is in conflict with the public’s economic interest is out of date. Instead, policy makers and the public are coming to understand that our economic and environmental interests are closely aligned. Governor Markell has asked the Department of Natural Resources & Environmental Controls (DNREC) to formally intervene in the Integrated Resource Planning (IRP) docket before the Public Service Commission (PSC). Specifically, he has asked DNREC to put public health costs on the table as part of the PSC docket. This will tip the scales significantly in favor of renewable energy and against continuing dependence on coal. These costs are considerable. Delaware’s Medicaid budget exceeds one half of one billion dollars; so health costs can hardly be considered to be incidental to a public discussion on energy policy. As we learned in the debate over wind power, long term scarcity of fossil fuels will make renewable energy more attractive over the long term. And, when the costs of carbon emissions are factored into the costs of burning fossil fuels, renewable energy sources look more economical in comparison. Finally, we are just becoming aware of the ways the burgeoning field of renewable energy offers new economic opportunities just when we need them. Nancy Floyd of Nth Power, a firm that invests in new energy technologies, has compared the clean energy business to the computer industry when the Macintosh came out in 1984. Who wouldn’t want a piece of that? Finally, as to whether there may be some tension between promoting green industry and the old fashioned work of environmental protection, I do not see such a tension. A thorough regulatory regime should capture all the costs and benefits of clean and dirty enterprises, making it easier for green industries to compete. Lax regulation of polluters is a form of subsidy. A polluting industry may show a profit to its investors, but generate costs that don't show up on its books. For instance, it has been estimated that capturing carbon from coal plants will increase costs at least 20 percent. Once coal power plants are required to take on those costs, either through new technology or a cap and trade system, the net costs and benefits of clean power look much more attractive. Seen in this light, attracting green industry requires that we not subsidize polluting industry through lax regulation. In summary, we see a firm commitment to renewable energy as having multiple benefits to Delaware’s economy in terms of health costs, energy costs and economic opportunities. HB 24 AN ACT TO AMEND TITLE 7 OF THE DELAWARE CODE RELATING TO HAZARDOUS WASTE MANAGEMENT. So what do environmental protection and economic development have to do with each other? The question has come up in relation to Jack Markell's climate prosperity strategy. Will Collin O'Mara, Markell's nominee to head DNREC, focus on economic development rather than protection and enforcement? When I asked O'Mara, he said climate prosperity starts with the proper enforcement of polluting industries. Put another way, a thorough regulatory regime should capture all the costs and benefits of clean and dirty enterprises, making it easier for green industries to compete. A friend summed it up as a carrot and stick approach. Lax regulation of polluters is a form of subsidy. A polluting industry may show a profit to its investors, but generate costs that don't show up on its books. Costs, such as the health consequences of breathing dirty air or the erosion of soil brought on by mountaintop removal mining or the accumulation of CO2 in the atmosphere, don't show up in a company's financial statements. But these costs are real and are born either by the neighbors of a dirty power plant or the public at large. For instance, it has been estimated that capturing carbon from coal plants will increase costs at least 20 percent. Once coal power plants are required to take on those costs, either through new technology or a cap and trade system, the net costs and benefits of clean power look much more attractive. In other words, if you have other ideas on how to close the gap, bring 'em on. But if you want to replace a provision you don't like, be prepared to find other savings. The Delaware Economic and Financial Advisory Council (DEFAC) will meet three more times between now and June, and may well lower revenue estimates even further. Which means if you want to replace $1.00 in cuts or taxes over here, you may have to impose $1.50 of pain over there. With conditions likely to worsen, leaders will be reluctant to close off options, no matter how unpleasant. Of course, it could all descend into chaos, but I somehow doubt it. The only thing worse for legislators would be to impose pain without agreeing to a budget. The Dow closed yesterday at 7223.98, up 9.55 percent for the week, though still down one third for the year. This is what qualifies as good news in this climate. Tom Noyes, a Delaware-based blogger who writes about business and finance for the British newspaper The Guardian, said it's more than people being scared. "There are some huge problems in the economy we have to work through. But if investors and consumers start to see some solid ground under their feet, then I think that helps in turning things around," Noyes said. It is nice indeed to see investors ready to get back into stocks. But problems like rising unemployment, enormous piles of toxic assets, and tepid demand won't be easily overcome. We've got a long way to go, folks. Delaware, through the appropriate state agencies, should promote deployment of carbon emission reduction technologies at existing coal plants in Delaware and should consider incentive[s] for viable and effective technologies. The State should work with these facilities to explore incentives and funding options such as R&D support, grants for capital investment, and tax relief. Any such state support would be wasteful of scarce resources in support of outdated and inherently dirty technology. Apart from the need to control other emissions, anticipated carbon emission controls will increase the cost of coal power by at least 20 percent, according to an MIT study published in 2007. 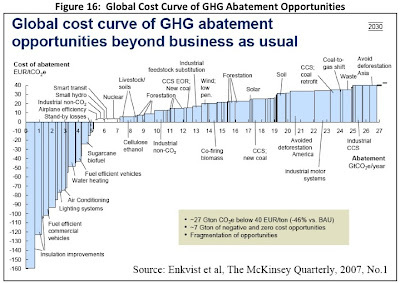 You will find “CCS: coal retrofit” at the right (more expensive) end of the scale. Capital markets are increasingly skeptical of coal power. Last year, investment banks Morgan Stanley, Citigroup, J.P. Morgan Chase and Bank of America announced that they would factor in the large and uncertain costs of carbon controls when considering whether to invest in new coal plants. If Wall Street wouldn’t fund coal technology (even before it collapsed), why should Delaware’s taxpayers? More stringent and inclusive cost analysis of coal power should also include factors dismissed by accountants as externalities, such as health costs and the clear and present danger posed by accumulated and unprotected piles of coal ash. Such costs may be external to a company’s balance sheet, but they must be considered as essential to the public interest. When all relevant factors are considered, this 19th century technology is not suited to meet the environmental and economic needs of the 21st century. Yes, it would be a good thing to reduce CO2 emissions from the Indian River plant. But reducing emissions can and should be accomplished through regulatory enforcement and cost shifting using a cap and trade system, either a proposed national system or extension of RGGI to include power plants. In light of the economic inefficiencies of further investment in coal power, I have doubts about support for the Mid-Atlantic Power Pathway Project or MAPP (page 94). The draft plan acknowledges the concern that the MAPP would make it easier to import power from “electric generation facilities with relatively high air emissions,” particularly those upwind from Delaware. This does seem to be at odds with the spirit and intention of the Electric Utility Retail Customer Supply Act of 2006, which called for greater reliance on home grown energy sources. I also have doubts about the argument that the MAPP would make it easier to distribute power from offshore wind to states west of Delaware. But the Bluewater Wind project has been scaled to meet Delaware’s needs, not those of the greater PJM grid. I think that investing in smart grid technology to better accommodate wind power and other renewable source close to home could be far more cost effective than building a power superhighway running through southern Delaware. The conventional wisdom that the public’s environmental interest is in conflict with the public’s economic interest is out of date. Instead, policy makers and the public are coming to understand that our economic and environmental interests are closely aligned. Many of the techniques and criteria used to analyze the costs and benefits of different sources and uses of energy reflect old assumptions that no longer stand up to careful scrutiny. When the costs of carbon emissions are factored into the costs of burning fossil fuels, cheap energy isn’t so cheap anymore, and renewable energy sources look more economical in comparison. Economic analysis of energy proposals should encompass long term costs, economic development opportunities and health costs, as Governor Markell has proposed. Delaware’s Medicaid budget exceeds one half of one billion dollars; so health costs can hardly be considered to be incidental to a public discussion on energy policy. Some of the recommendations stand up to such analysis, and deserve public support, including: Recommendation 37: Clean Energy Business Development Initiative, Recommendation 12: Distributed Renewable Energy, Recommendation 25: Alternative Fuel/Fuel Efficient Vehicles, Recommendation 27: Smart Growth and Recommendation 28: Transit-Oriented Development, to name a few. Energy Policy should be elevated to the Governor’s office by creating a Governor’s Executive Office for Energy Policy. The scope of the energy policy challenges and opportunities facing Delaware goes far beyond the long standing functions of utility regulation and encouraging conservation. For instance, our state government is not adequately equipped to meet the opportunities presented by the burgeoning renewable energy industry. Nancy Floyd of Nth Power, a company that invests in new energy technologies, has compared the clean energy business to the computer industry when the Macintosh came out in 1984. Governor Markell has said in his budget briefings that Delaware’s budget crisis stems from an economic crisis. State government budgets for roughly 15,000 full time employees, not including public and higher education. With a workforce this large, we should be able to provide the staff to make Delaware a leader in creating a new energy economy. Talking Points Memo alerts us to this video in which concern troll Mark Halperin asks whether Obama is trying to do too much. Tonight Chuck Todd made a very good point in his remarks before the National Association of Counties. (Sorry, no video available at this hour.) Todd pointed out that, given enough time, Washington forces can kill any policy initiative. Think back to Clinton's economic plan (which barely passed) and health care plan that never came close to a vote in Congress. But Obama has at least three or four big things going on right now, and organizing to defeat them all is simply beyond the capability of the opposition on a good day (of which the GOP hasn't had many recently). Even if Obama gets beaten back on his budget or on health care, he still will have pushed through the recovery package, rolled back Bush's environmental and energy policies, closed Gitmo and set a timetable for pulling out of Irag. Just today he opened up federal funding for stem cell research, declared new standards for the role of science in public policy and abrogated Bush's signing statements. There have been times when Americans like the idea of government not trying to do too much. This is not one of those times. Seven presidential terms have come and gone since Ronald Reagan declared that "government is the problem." In a time a of crisis, people want their president on the job, even if it means tackling more than one problem at a time. The Governor's Energy Advisory Council has developed a draft energy plan, which has been presented at two public meetings. The final such meeting will be held this coming Monday, March 9, from 5 to 7 p.m. at DNREC's Lewes Field Facility, 901 Pilottown Road in Lewes. You can view the plan, or a shorter summary, at the Energy Office's website. Public comments are being accepted up until 4:30 p.m. on March 12 by email to DNREC_EnergyPlan@state.de.us. Some of the recommendations deserve public support, including: Recommendation 37: Clean Energy Business Development Initiative, Recommendation 12: Distributed Renewable Energy, Recommendation 25: Alternative Fuel/Fuel Efficient Vehicles, Recommendation 27: Smart Growth and Recommendation 28: Transit-Oriented Development, to name a few. The breadth of energy policy has reached a point at which it cannot be effectively managed by the long standing but limited functions of utility regulation or conservation measures. I discussed some of my thoughts at a public meeting on Thursday, and will submit written comments, which I will post here next week. Public comments will be included in an appendix and delivered to the governor. General Motors could go bankrupt. But you knew that, didn't you? GM's annual report filed with the US securities and exchange commission (SEC) included this chilling statement: "There is substantial doubt about our ability to continue as a going concern." The phrase "going concern" is a term of art in financial reporting. If you want to know what it means, head over and read it for yourself. The more serious question is whether auto sales will rebound enough to keep GM afloat, even with federal bailout money. The February auto sales report for the industry as a whole is not quite enough to meet GM's "downside" projection target of 9.5 million units sold in the U.S. this year. In January of 2007, Jack Markell published an op-ed on Delaware’s energy future in which he urged regulators to take a long view of the economics of energy production. Yesterday, the News Journal reports that Markell declared that regulators should take a broader view of the costs of energy by including health costs in making decisions about meeting our energy needs. Markell is asking the Department of Natural Resources & Environmental Controls (DNREC) to formally intervene in the Integrated Resource Planning (IRP) docket before the Public Service Commission (PSC). The IRP, which is Delmarva Power’s long range plan to provide electricity to Delaware, is now before the PSC. Pepco Holdings is planning to put up a $1.425 billion, high-voltage power line through to transmit more power from coal-rich Appalachia. But state environmental officials have concerns that reliance in a long-term plan on out-of-state generation by coal-fired plants spews toxins into the air that eventually move east and can end up in the lungs of Delawareans. Coal power may look cheap on paper, until you factor in the health costs of breathing dirty air. Jeremy Firestone and Willett Kempton calculated in 2007 that the health care savings of replacing coal power with wind power to be one billion dollars over the next 25 years. It’s not hard to see how some of these costs come back to the state budget; Delaware’s Medicaid budget is more than $500 million this year. Do these guys understand that they're being played? Not missing any opportunity to make Rush Limbaugh the figurehead of the GOP, White House Chief of Staff Rahm Emanuel called the brash talk show host the "voice and the intellectual force and energy behind the Republican Party" on Sunday. HUGHLEY: Like Rush Limbaugh, who is the de facto leader of the Republican Party. STEELE: I’m the de facto leader of the Republican Party. According to a Gallup poll released last month, Limbaugh is viewed favorably by Republicans, but unfavorably by independents by a 25 to 45 percent margin.